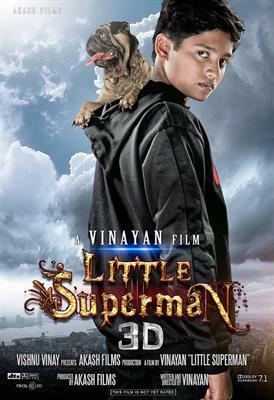 Little Superman 3D malayalam movie directed by Vinayan featuring Master Denny and Baby Nayanthara in lead roles. Renjith, Madhu, Shammi Thillakan, Krisha, Praveen will also be seen in prominent roles. The movie produced by Vinayan and V M Babu under the banner of Akash Films is slated to get released during Onam 2014. For the lyrics of Kaithapuram, the tunes are set by Mohan Sithara. The cinematography is handled by K G Ratheesh. After producing rave reviews for his previous venture 'Dracula 3D', filmmaker Vinayan is ready with his next venture which would boost of having graphics of international standards with 2 Crores exclusively to be spend for it. Titled 'Little Superman 3D', is a magnum opus project which will have child artist Deny playing the lead role. Being selected from 30,000 applicants, Deny is being supported by Baby Nayanthara, Renjith, Madhu, Shammi Thillakan, Krisha, Praveen will also be seen in prominent roles. Shot in Afghanistan, Kochi and Alleppey, this fantasy movie will be released in Malayalam, Tamil, Telugu and English languages. The graphics of Little Superman 3D is being handled by an international company, which has worked behind the screen for movies like 'Avatar' and 'Life of Pie'. The movie is themed around a 12 year old boy Villi. Villi Wilson (Deny) is the son of Wilson George and Jeny. Wilson George (Ranjith) works as an Executive Engineer in the Irrigation department who carry out his jobs truthfully and is a passionate sportsman. Villi who was having a gang of his own at school, did organize and implement plans whenever some issues occur in the school. As the activities of this gang are intelligently planned, their actions and the existence of the gang are unknown. Saira is Villi's soul mate and both are much attached to each other.Once, Wilson George gave proof against his tainted higher officials, which resulted in the cruel murder of him and his wife. Villi who narrowly escape with his dear dog Tinku, begins a journey in search of the murderers with the help of his uncle Alby. Rest of the story which is clubbed with fantasy and reality would take the audience to the next phase while keeping the intact. Looking through the eyes of Villy, the movie zooms into some interesting facts which he seen in the dream. Ansiba will be seen as his sister while Praveena will be seen in the role of Deny's mother in this movie. Produced by Vinayan and V N Babu under the banner of Akash Films, the movie would reach theatres as an Onam treat. For the lyrics of Kaithapuram, the tunes are set by Mohan Sithara. The cinematography is handled by K G Ratheesh.